The procedure of the work instruction is to provide methods and guidelines for risk analysis study using Process Failure Mode and effective Analysis. PFMEA: PFMEA provide an analytical method and approach when working with potential failure modes and their related causes. The PFMEA provides methods and analytical approach as requirements of appropriate processes like design, production processes etc. That considering possible failures in the appropriate subject like costing concern, safety, performance, reliability and quality etc. To using the PFMEA by engineers can get a sufficient information and data about manufacturing processes. Development concern, in order to avoid these possible of failures which describes in PFMEA. PFEMA provides tools and methods that help to determine cause of failure. In case cause, risks show in PFMEA on higher priority, the concern authority can take an action accordingly. To preventing a problem before it makes damage or losses. How to implement work Instruction for Process failure mode and effective analysis? The procedure / work instructions can implement in the various workplaces such as production lines, planning where required to implement risk management. Where potential risk are identified, and production planning needs to effective implement in the manufacturing. Related product realization process stages and activities is to concentrate the quality system related controls on the various process stages. Target activities and locations with high risk are identified. The purpose of this guidelines / work instructions is to manage / implement proper methods which is used as standard system methods. And its various instructions that needs to define as per working environment and identified risks levels. The collected analysis study by collected information from the study like process failure mode and effective analysis. In the failure mode and effect analysis define all the details descriptions are cleared. Where describe the product or process with specific description. that will be makes easier for concern peoples, for manage failure mode and effective analysis. Quality managers are responsibility to implement the required steps.It’s highly recommended that make a diagram of the product and process. The diagram must display the relationship between process and sub-process stages of each individual process. In the failure made and effective analysis and its format should be unique as comfortable for use and communicate. That is also supported to customization and requirements of internal system. Where all the important information should be merge in the general lines. In the failure mode and effective analysis should covered all the major components and devices of target processes. The item must be listed in a logical manner. The failure mode is defined with root to points the product and process. The measurement of the failures and implementation are depending on the industry segment. The measurements are should manage according to product / process standard of particular industry. Description of the product / process. Managing / Draw a diagram of the product / process. 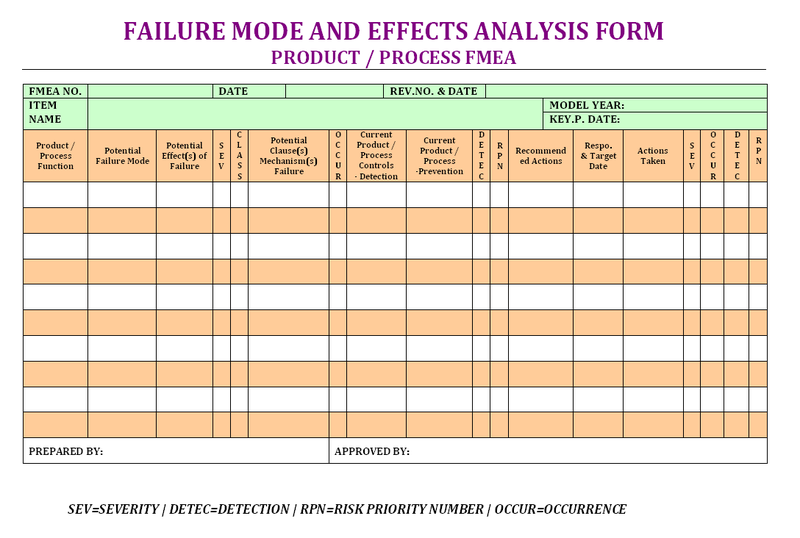 Managing Process Failure mode and effect analysis (PFMEA). Enumerate or Tally the materials / items that make up the product / process. Identification of potential failure modes concern with processes and product. Managing each failure mode using its technical fundamentals. Describe the effects of the each of failure modes indexed and measure the severity of these effects. Identification of possible reasons of each failure mode. Quantify the probability of occurrence of each failure mode causes / reasons. Identifications and verification of each available controls that contribute to the prevention of occurrence of these failure mode causes. Implementation the defined points that defined as action. The implementation of the document of process failure mode and effect analysis in the manufacturing units are highly recommended. Because the most of failures can be possible to eliminate if the proper analysis of mechanism, process breakdown etc. The process management and mapping both the activities, regular tasks and implementation of product quality requirements are accurately defined and implemented. Next PostWhat is standard Working Procedure, and How to Write?